We promise to create an environment that hugs you when you walk in and pats you on the back when you leave. We believe that people deserve to experience a fully enriched life so they are inspired to live positively and thankfully. We want to create a movement that adds soul to the industry. Through smart interior design and a thorough, collaborative process, we make sure to give your home the makeover it deserves. It’s hard when you get caught up in the day-to-day, so let us do the work for you. All you have to do is tell us your vision, and we’ll handle the rest. Our team of experts is led by husband-and-wife duo Katie and Ruben Gutierrez, who have over 25 years of combined experience with South Florida interior design. We, as a team, look at each client as a new opportunity to not only start a fun project but also get to know you. Our goal as a company is to make you feel comfortable and in control of your design, and through our years of experience mixed with our enthusiastic pioneering approach, we feel our process provides great results while getting the job done efficiently and, most importantly, enjoyably! Questions? Don’t be shy—email or call! We want to hear what you have to say. Simply put, our philosophy is using your favorite experiences, cultures, memories, cities, styles, heirlooms—or anything that speaks to you—and creating a space that reflects it all. We ask you this: Have you ever been to a flea market or home decor store and liked something but then thought, “This doesn’t fit the look”? If so, you’re a victim of inopportune design. Through our biographical design approach, we collect your passions and deliver them to you in a way that makes sense in the design world. And, most importantly, we’re passionate about collaborating with you to make this happen. At Errez Design Studio, our mission is to inspire our clients through transparency, innovation, friendship and our best design. We want to reimagine how design is interpreted and understood with our biographical design approach, as well as by making the interior design process fun and stress-free for our clients and all involved. Our company vision is to transform the industry by leading in style, eliminating its superficiality trait, and giving it a fresh, more friendly perspective. We believe this will be the next generation of South Florida’s interior design and beyond. 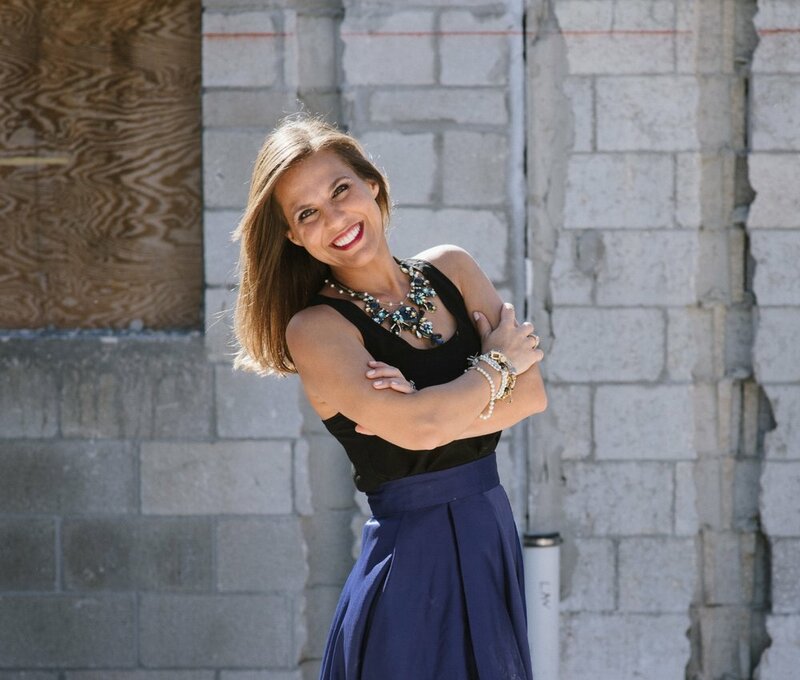 I used to think being an interior designer was the best thing in life—then I got married, started ERREZ Design Studio with my husband, had my son, James, and became a part-time professor for Florida International University. Now, as an interior designer, mommy, wife, professor and entrepreneur, I know for certain the best thing in life is my ability to wear multiple hats so naturally, and I love every part of it! Born and raised in Miami, I was always exercising my creativity and imagination through different outlets, especially through storytelling. (Fun fact: I won an award for storytelling and competed through debate at the state level. I also won a college scholarship for a written story contest.) As I got older, I yearned for something more: I wanted to combine my love for creativity with my desire to help others. That’s when my admiration for interior design was born. I started my official journey with design at the University of Florida, where I was heavily involved in school events and graduated with a master’s degree in architecture. After UF, I made my way back down to Miami, where I worked for MC Harry, one of Miami’s oldest architecture firms located in Coconut Grove, and was actively involved in my community through volunteering and as vice president of a business networking group. I always knew, though, that I had a bigger calling in the industry, and that’s why I started ERREZ Design Studio with Ruben. I made myself a promise: I want transform the way people think about interior design. Good design has many facets, just like someone’s personality, and our goal is to find all the elements, traits and memories that make you, well, you, and incorporate it all of that into a functional, fresh yet nostalgic space that speaks volumes. I’m not just here to guide you design-wise; I’m here to create a fun experience that lasts a lifetime—or at least until you want to redesign another space! Inspiration drives me to live the best version of myself. As a self-proclaimed travel and health and fitness enthusiast, I have enjoyed some pretty amazing journeys. Born in Boston, Ma. and raised in Cali, Colombia, these are two of the 100 cities across the globe I’ve been fortunate enough to explore. The enriching experience of my travels coupled with a bicultural, bilingual heritage, play a major role in my fascination and versatility with design. My artistic sense became evident from a young age. I would craft and build and spend hours taking in the art of nature, a perfect canvas of breath- taking patterns, colors and sounds. I view the purity of natural stones, their raw textures and colors, as one holistic soul with a history of its own. Bringing this soul to life through design is my dream come true. I’m a graduate of the University of Miami with a dual bachelor’s degree in business and marketing and advertising. A unique combination of analytical and artistic senses have guided me through 15 successful years in the field of marketing and advertising, working with Fortune 100 companies such as Disney, ESPN and Publix Super Markets. A certificate in interior design from the University of Miami is my most recent achievement, fueling my creative side even further and preparing me for my current position of Managing Partner at Errez Design Studio. Working at Errez Design Studio is truly inspiring. The close relationships we establish with our clients help me bring my passion for design to new levels. By exercising both my creative ability and business savviness, I ensure that all our client needs are fulfilled. Ever since I could remember, I’ve liked to build things. From building Legos at a young age to building my business now, I always knew it was where I belonged. Naturally, my interest in the field began with architecture. I graduated from Florida International University with both a bachelor’s and a master’s degree in the subject. While I was studying, I was a full-time worker at local architecture firms. I always drew my inspiration for architectural design from art and experiences, and to this day, this stands true. I love places that conjure up a feeling of nostalgia but at the same time, reflect a freshness and newness unseen anywhere else. Cities with high-density urban areas, like New York City, have this quality. I began to fully understand (and appreciate) the elements of interior design while I was in the workforce—and little did I know that I’d come to love it. I meshed both architecture and interior design with Alison Spear, an architect known to frequently cross over into interiors. Under Alison, I received some of the best training in the luxury market, and here, I was able to mix architecture, art and design in new form. The next logical step was to build a business. I knew that with Katie’s experiences, my experiences and the right methodology, we can create a new way to communicate interior design with a fresh and nostalgic approach—something different and new to in the industry. We want to alter the way people think about design. The industry as it stands tends to have a bad rap—something out of reach that only elitists can afford—especially in South Florida. But we’re here to change your mind on that. We’re firm believers that good design can make the everyday tasks ceremonial. It helps you connect to your past, aspire for your future, make your day-to-day better, and soothe you when you’re feeling down. We can’t wait to show you what you’re missing out on.